Data formatting is something that many people don’t consider when they are first creating a spreadsheet, but it often becomes an issue later in the spreadsheet’s life cycle when you need to do something that you hadn’t planned for. This is common when multiple pieces of data are included in one cell, but should have been separated. This can be an issue if you have a lot of data, as the initial thought is often that this data needs to be split manually. 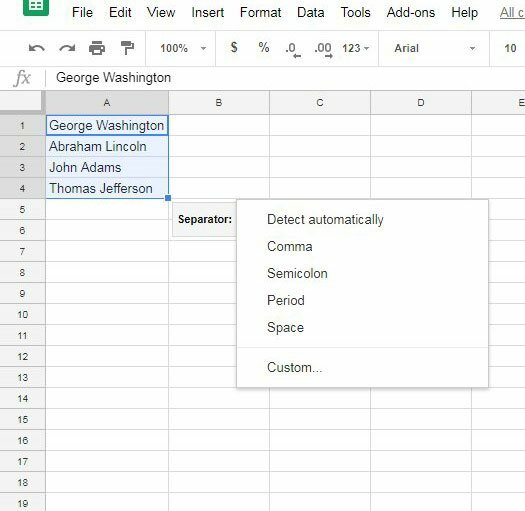 Fortunately Google Sheets has the ability to split data into multiple columns by defining a separator. 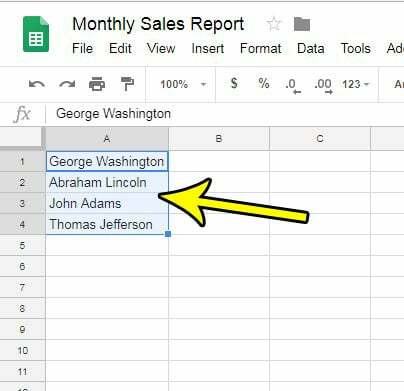 Our tutorial below will show you how to split data in Google Sheets. The steps in this article were performed in the desktop version of Google Chrome. 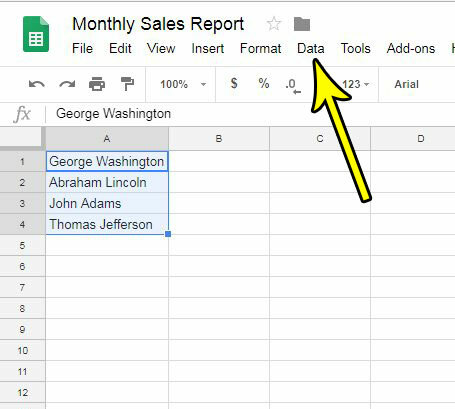 This guide assumes that you currently have a column of data in a Google Sheets spreadsheet, and that you would like to split the data in that column into two columns. The example below will use full names that I am going to split into first names and last names. 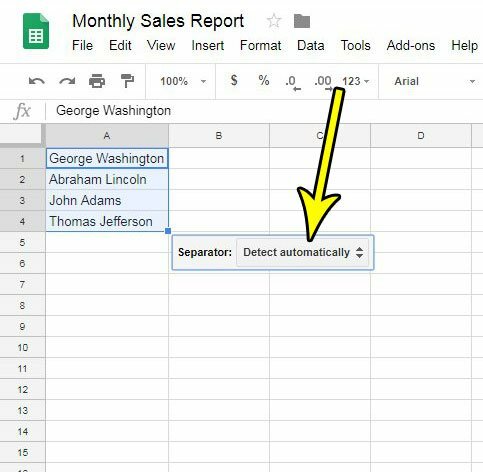 Google Sheets offers an option to split data that is separated by a space, which is the option I am going to use, but you are able to choose from a number of different options for choosing how you want to split that data. Step 1: Sign into your Google Drive and open the Sheets file containing the data that you want to split. Step 2: Highlight the data that you want to split into additional columns. Step 4: Choose the Split text to columns option. Step 5: Click the dropdown menu to the right of Separator. Step 6: Select the way that you want to split your data. I am going to use the Space option for my example, but you can select whichever option is appropriate for the data you are trying to split. Do you have your Sheets file shared with other people, but you don’t want them to be able to change information in the spreadsheet? 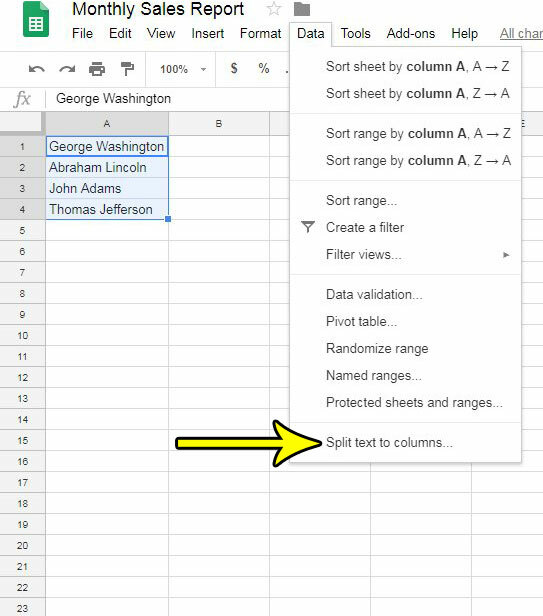 Find out how to protect a worksheet in Google Sheets so that others are not able to edit it.